From 1878 until the implementation of Delaware’s Klair Law in March 1919, three breweries dominated the industry in the state. 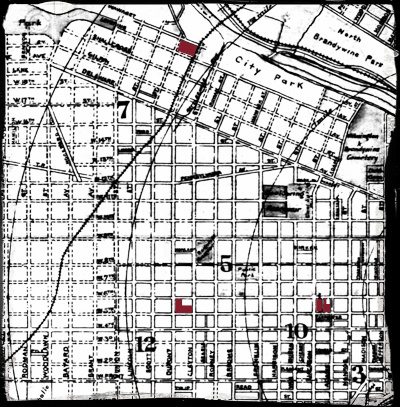 The “Big Three” were located in Wilmington at Lovering Avenue & Scott Street (Hartmann & Fehrenbach), 5th & Adams Streets (Stoeckle’s Diamond State Brewery), and 5th & DuPont Streets (Bavarian Brewery). Wilmington’s “Big Three” were largely responsible for growing an industry that, by 1898, had become the sixth largest in the state. 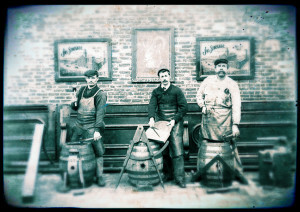 From the breweries themselves, to the hotels, saloons and restaurants, to the bottle makers and bottling companies, beer was directly responsible for hundreds of jobs and millions in revenue by the end of the 19th century. The Big Three managed to survive and, sometimes, thrive for most of the four-decade long “Golden Age of Brewing”, despite economic hard times, a world war and constant challenges from powerful forces in the Temperance and, later, Prohibition movements. By 1907, two of Delaware’s three counties had adopted their own Prohibition measures and were bone dry. Ten years later, New Castle County followed suit, leaving the city of Wilmington as the only place where it was still legal to produce and sell alcoholic beverages. Statewide Prohibition effectively killed the brewing industry in Delaware in 1919. The Big Three tried to stay afloat by converting their plants to produce “near beer” (i.e.- beer with the alcohol removed) and soft drinks. Ultimately though, the production shifts were to no avail, as revenues from meager sales of Prohibition-era drinks could not cover the costs of running massive physical plants. 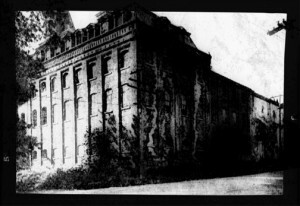 By the end of 1925, the last of the Big Three breweries closed. To make matters worse, the second generation owners of the Stoeckle and H&F breweries all died with no heirs interested in keeping the businesses going. Legal beer production may have stopped at all three breweries during Prohibition but illegal production certainly did not. At one time or another, busts occurred at all of the Big Three’s facilities, each of which had been surreptitiously taken over by crime rings from outside the state. While the Diamond State and Bavarian Breweries somehow managed to survive the thirteen years of National Prohibition, the H&F Brewery was not as fortunate. Much of the complex, which had fallen into severe disrepair, was sold and subsequently torn down just prior to Repeal. The other two breweries would be eventually be revived in the 1930s but the new companies would never experience the same type of success they had witnessed during the Golden Age of Brewing.